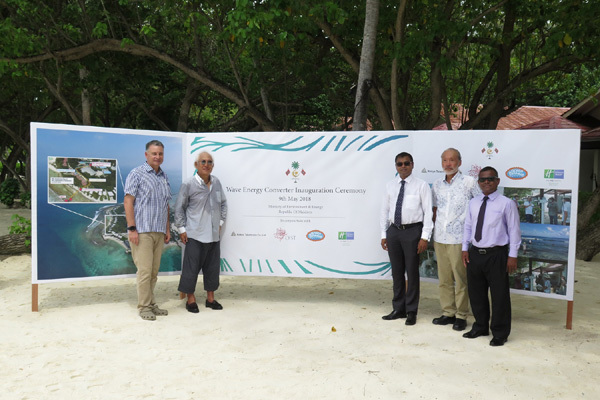 The world’s first pilot project to harness electricity from powerful surf waves was officially launched at Holiday Inn Resort Kandooma Maldives recently. The project is the brainchild of Professor Tsumoru Shintake of The Okinawa Institute of Science and Technology Graduate University (OIST), the Ministry of Environment and Energy (MEE) of the Republic of Maldives and Kokyo Tatemono Company Limited (Kokyo) of Tokyo, Japan. The project involves testing prototypes of the Wave Energy Converter units (WEC-units) in the Maldives with the aim of supplying sustainable energy and reducing carbon emissions. Professor Shintake, leader of the Quantum Wave Microscopy Unit, OIST, and his colleagues designed special WEC-units which can capture energy from surf waves along the shore-line and convert it into usable electricity as part of the wave energy project which was launched in 2013. Professor Shintake’s WEC-units have been carefully designed, taking inspiration from nature: the blade design and materials are inspired by dolphin fins and the flexible posts resemble flower stems. One of the principal features of the WEC-units is that the generating turbines are designed to be located at the mean sea level to harness the wave energy most effectively.